Climate Forecasting Unit Melanie Davis (IC3) & Jean-Pierre Ceron (Meteo France) EUPORIAS WP41. 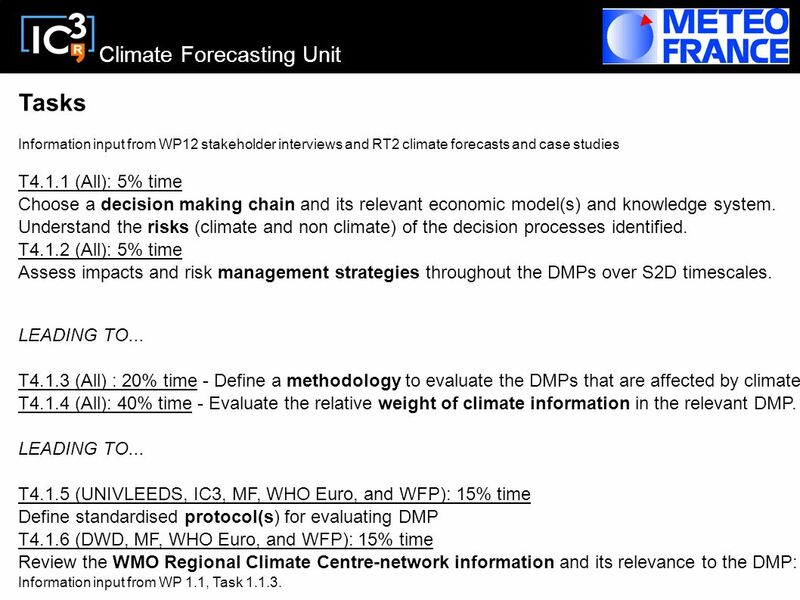 2 Climate Forecasting Unit Tasks Information input from WP12 stakeholder interviews and RT2 climate forecasts and case studies T4.1.1 (All): 5% time Choose a decision making chain and its relevant economic model(s) and knowledge system. Understand the risks (climate and non climate) of the decision processes identified. T4.1.2 (All): 5% time Assess impacts and risk management strategies throughout the DMPs over S2D timescales. LEADING TO... T4.1.3 (All) : 20% time - Define a methodology to evaluate the DMPs that are affected by climate. T4.1.4 (All): 40% time - Evaluate the relative weight of climate information in the relevant DMP. 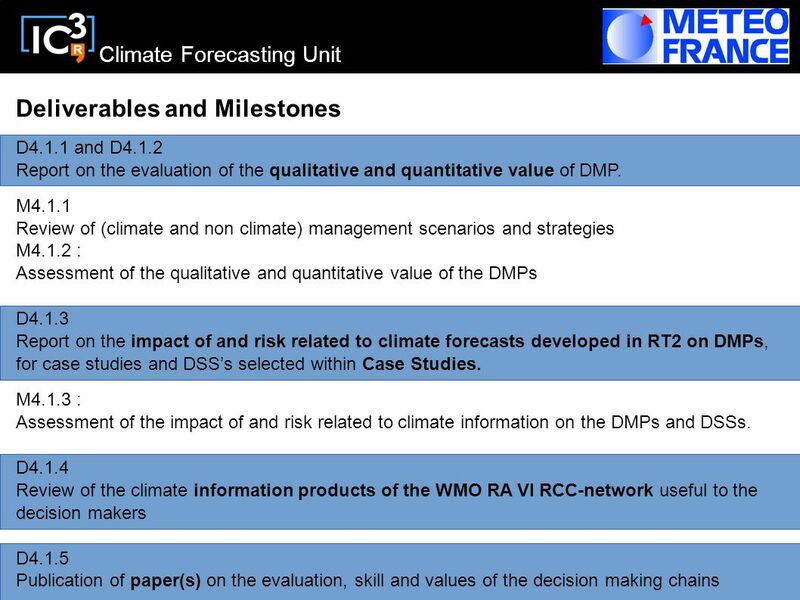 LEADING TO... T4.1.5 (UNIVLEEDS, IC3, MF, WHO Euro, and WFP): 15% time Define standardised protocol(s) for evaluating DMP T4.1.6 (DWD, MF, WHO Euro, and WFP): 15% time Review the WMO Regional Climate Centre-network information and its relevance to the DMP: Information input from WP 1.1, Task 1.1.3. 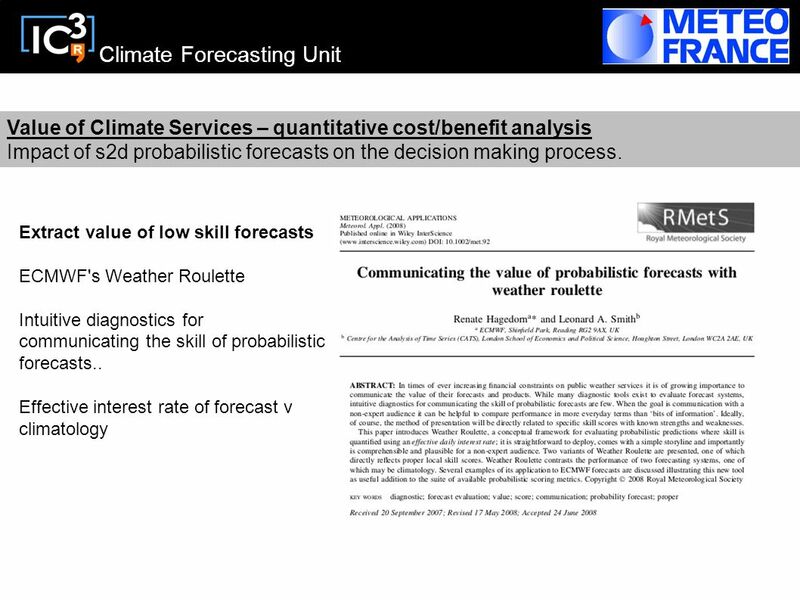 3 Climate Forecasting Unit Value of Climate Services – quantitative: cost/benefit analysis Impact of s2d probabilistic forecasts on the decision making process – quantitative. Role of Climate Services – qualitative: the human dimension Effect of Climate Services on stakeholders decisions – qualitative. 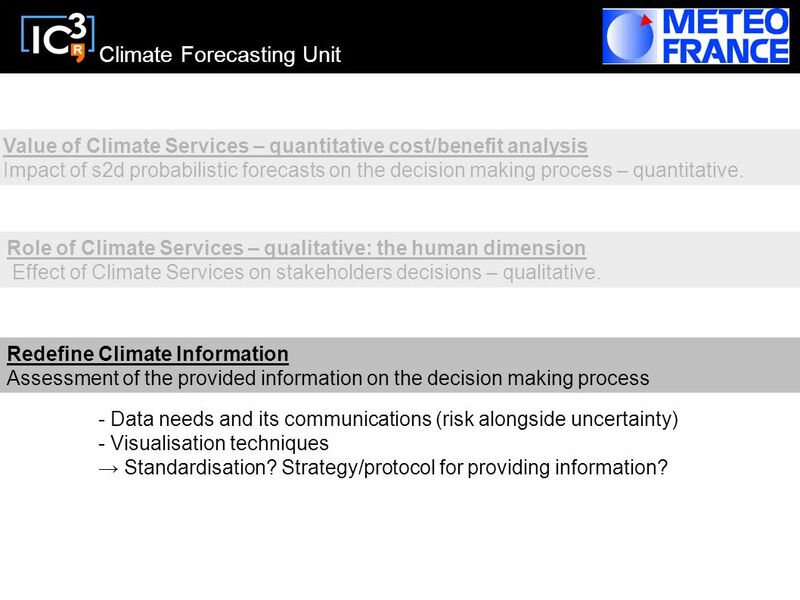 Redefine Climate Information Assessment of the provided information on the decision making process Towards New Business Opportunities (WP45) Downstream, Operational Decision Support Systems. 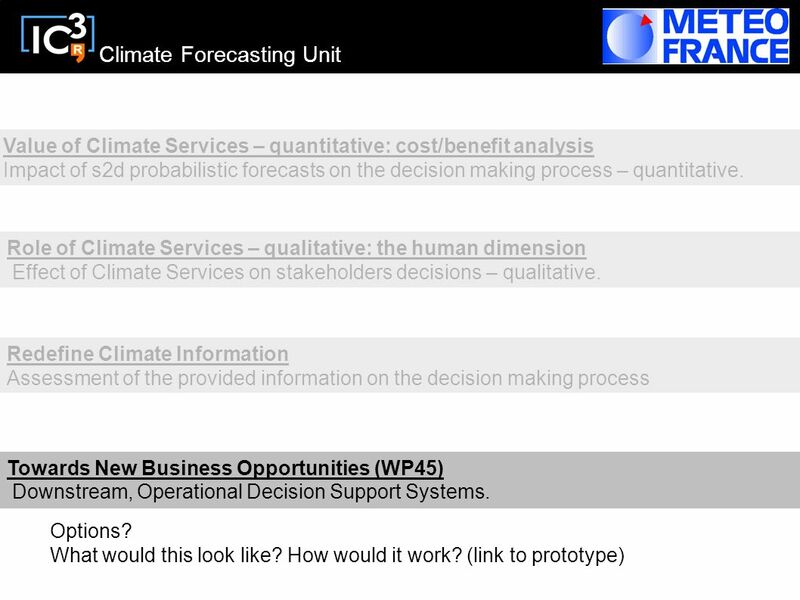 5 Climate Forecasting Unit Value of Climate Services – quantitative cost/benefit analysis Impact of s2d probabilistic forecasts on the decision making process – quantitative. 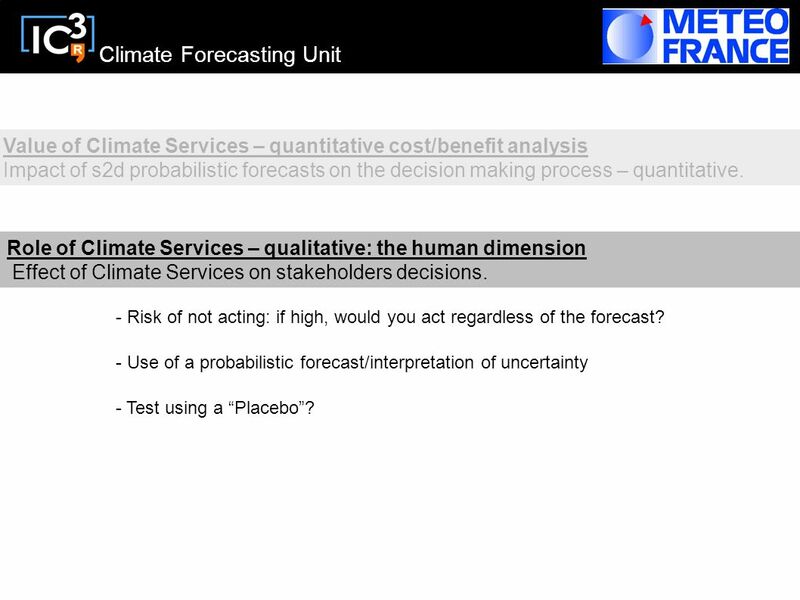 Role of Climate Services – qualitative: the human dimension Effect of Climate Services on stakeholders decisions. - Risk of not acting: if high, would you act regardless of the forecast? - Use of a probabilistic forecast/interpretation of uncertainty - Test using a “Placebo”? 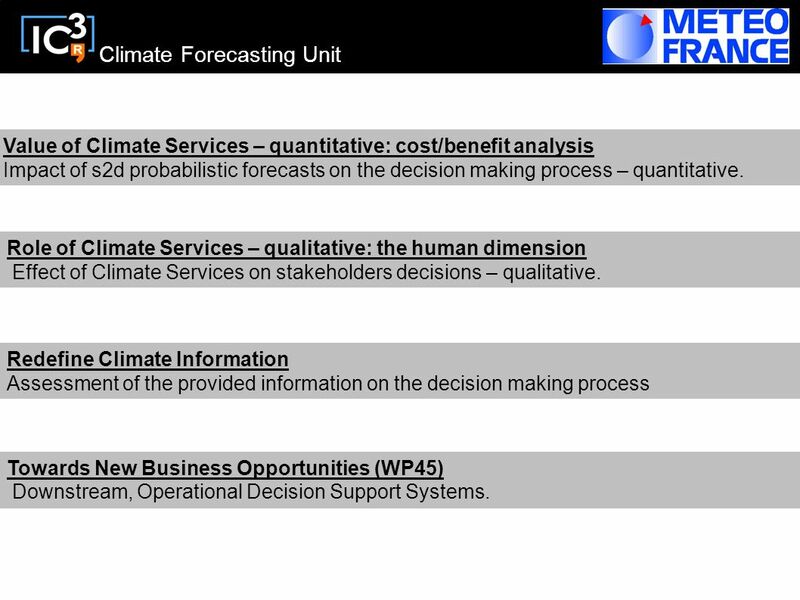 6 Climate Forecasting Unit Value of Climate Services – quantitative cost/benefit analysis Impact of s2d probabilistic forecasts on the decision making process – quantitative. Role of Climate Services – qualitative: the human dimension Effect of Climate Services on stakeholders decisions – qualitative. 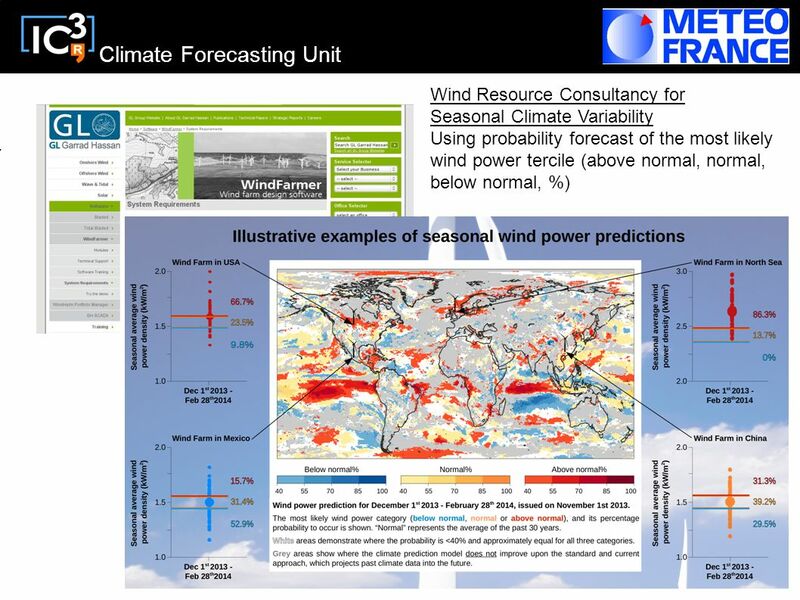 Redefine Climate Information Assessment of the provided information on the decision making process - Data needs and its communications (risk alongside uncertainty) - Visualisation techniques → Standardisation? Strategy/protocol for providing information? 11 Climate Forecasting Unit.. Halcrow Water, 2013. UK Environment Agency. 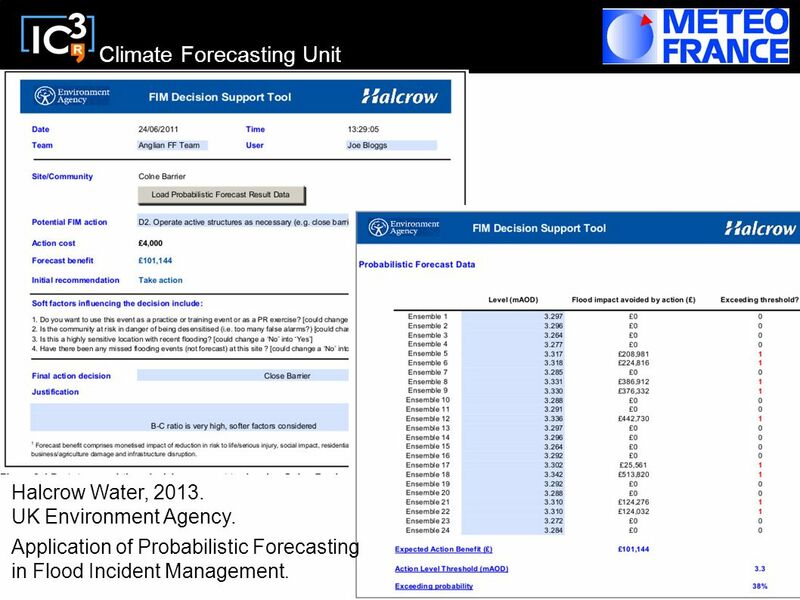 Application of Probabilistic Forecasting in Flood Incident Management. 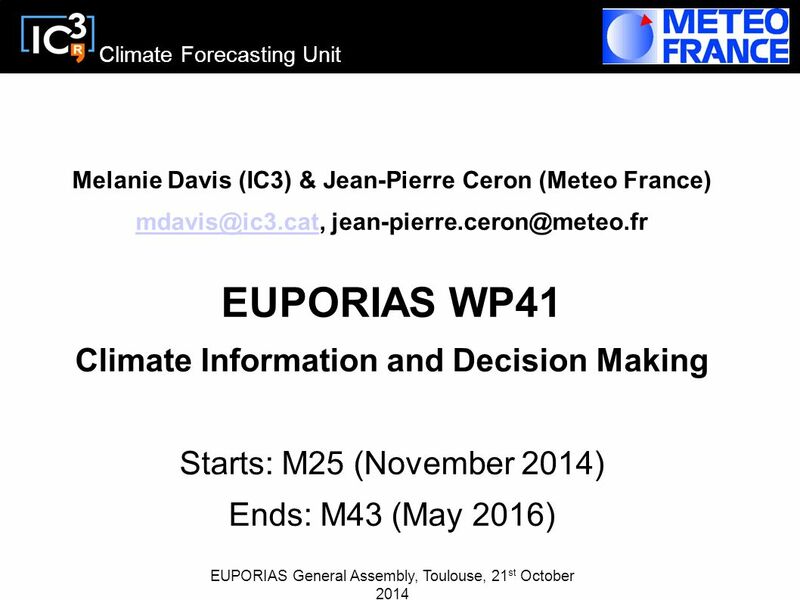 Download ppt "Climate Forecasting Unit Melanie Davis (IC3) & Jean-Pierre Ceron (Meteo France) EUPORIAS WP41." 1 00/XXXX © Crown copyright Hadley Centre ENSEMBLES ENSEMBLE-based Predictions of Climate Changes and their Impacts. Recent progress since HelsinkiRecent progress since Helsinki Plans for the next reporting phasePlans for the next reporting phase Expected contributions. FP7 Research in the field of climate change vulnerability, impacts and adaptation (a brief update for the Environment Programme ) Wolfram Schrimpf DG Research. Reflections on Cross-cutting issues in Climate Change Impact Assessment Alistair Hunt University of Bath & Metroeconomica, UK Global Forum on the Economic. RESTRICTED Adapting to Climate Change in the UK. RESTRICTED Summer 2007 floods in the UK: 55,000+ homes and businesses flooded 140,000+ homes in Gloucestershire. ARECS: ADVANCING RENEWABLE ENERGY with CLIMATE SERVICES Melanie Davis, Climate Services for Renewable Energy GEO European Project Workshop, 15 th April. 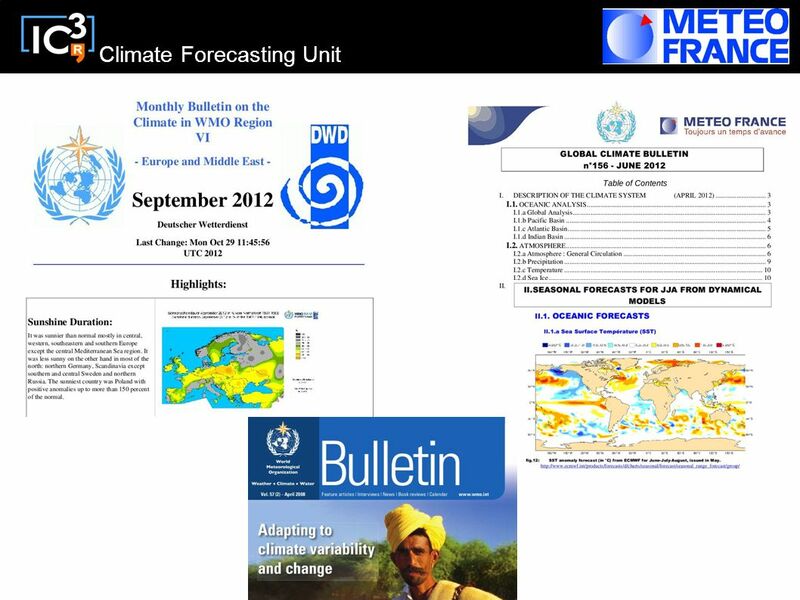 Guidance of the WMO Commission for CIimatology on verification of operational seasonal forecasts Ernesto Rodríguez Camino AEMET (Thanks to S. Mason, C.
Natural Hazards. Integrated Risk Assessment & Scientific Advice Uncertainty in forecasting and risk assessment Hydro-meteorologicalVolcanoesEarthquakes. An Internet Tool For Forecasting Land Use Change And Land Degradation In The Mediterranean Region Richard Kingston & Andy Turner University of Leeds UK. RT6 RT3 and RT4/RT5 Feb 2005 Meetings ENSEMBLES Meetings RT3 Copenhagen, RT4/RT5 Paris, February 2005 RT6 Assessments of impacts of climate. Conclusions, planning and prospects Follow-up committee meeting 6 October, Leuven. Evaluation of adaptation scenarios Follow-up committee meeting 6 October, Leuven. ROLE, CHALLENGES & OPPORTUNITIES for NMHS in SERVICING RISK TRANSFER MARKETS Dr William Wright Team Leader ET1.2 - Expert Team on Observing requirements. Where IOOS Meets the Land and Atmosphere: Assessing/Mitigating Risks of Current & Prospective Coastal Inundation/Erosion Alaskan Coastal Climatology Workshop. Add your Logo in the slide master menu Module IMPLICATIONS WP8- SERVICES WP9-SOCIOECON WP10-VALUATION. WMO, third Meeting of the RA VI Management Group, 9-10 April 2015, Istanbul, Turkey Working group climate and hydrology Ernesto Rodriguez Camino and Dominique.